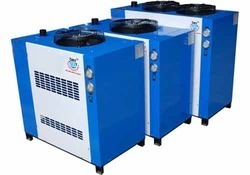 We are introducing an outstanding gamut of Refrigerated Air Dryer. Offered air dryer converts the moisture in the condensed form, which gets separated and drained out in, separates equipment. They are used in various applications in many industries and well known for their long service life and strong construction. - Tower optimally packed to avoid dessicant bed movement and attrition losses. - Inlet & outlet Air diffusers to prevent channelling. - Dew point obtained as low as -70°C.